"You may have heard this story...a woman asks to buy a cookie recipe and is told it will cost 'two-fifty.' She thinks this means $2.50, but then she gets her credit card bill back and finds out it is $250.00. Outraged, she spreads the recipe far and wide to try and get her money's worth. I first heard this story 6 years ago and was given a recipe on a sheet of paper which bore the date '1986.' 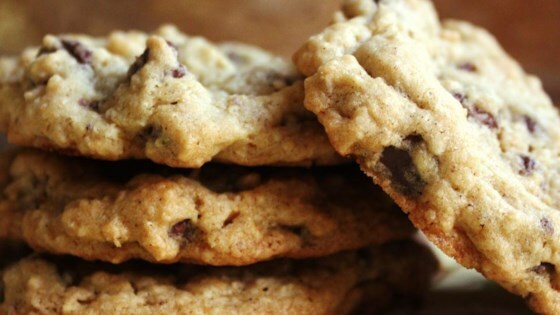 The supposed originator of the recipe was a well-known cookie company. I have since heard this tale again several times, with the recipe originating from different upscale department stores. True story? Who knows, but it's a darn good cookie. Here's my version." Preheat oven to 375 degrees F (190 degrees C). Measure oats into a blender or food processor, and then blend to a fine powder. Set aside. In a large bowl, cream together butter and sugars. Beat in the eggs one at a time, then stir in the vanilla. In a separate bowl, mix together flour, oats, salt, baking powder, and baking soda. Stir dry ingredients into creamed butter and sugar. Add chocolate chips, grated chocolate, and nuts. Drop by rounded teaspoons onto ungreased cookie sheets. Bake for 6 to 8 minutes in the preheated oven.